Call The Aerial Guys today on 01274 317054 for a no obligation estimate and to arrange an appointment. If you live in Bradford and are looking for local TV or satellite installation and repair experts, then call The Aerial Guys. We are passionate about providing you with the best possible service. Contact us today on 01274 317054 to book an appointment. The Aerial Guys are a company who specialise in the installation and repair of all TV aerials, helping you to achieve the best possible picture from your television setup. Our expertise allows us to supply and install the best aerial for the job in addition to the diagnosis of a wide range of reception related TV problems. 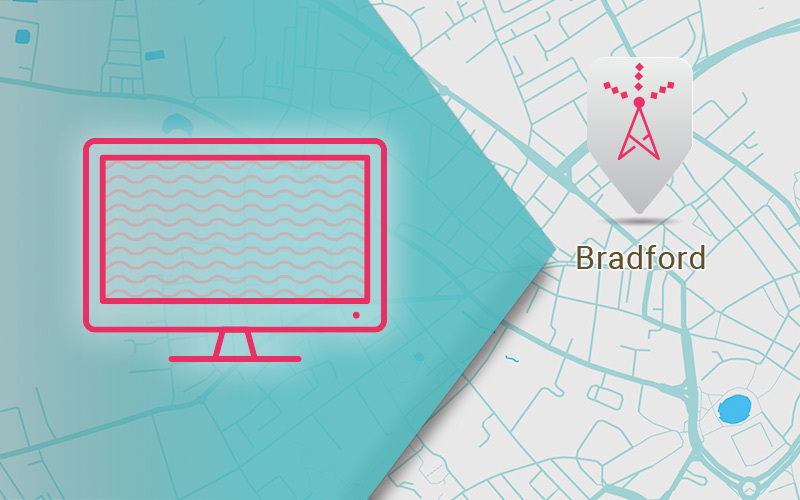 Whether you require TV aerial installation in Bradford or simply require experienced engineers to improve your existing setup by providing aerial alignment in Bradford, we can offer the advice and guidance you require to enhance your TV viewing experience. Call us today to work with the local TV aerial engineers that you can rely on. There are several different types of aerial available and each of them are designed to fulfil a specific role. As aerial installers in Bradford, we can supply you with a high quality Freesat aerial which is going to pick up all of the satellite channels available to you in your area, in addition to a variety of On Demand services through the incorporation of a set-top box. We can also supply you with a premium digital aerial in Bradford which is perfect for providing you with high quality Freeview television in the UK, and is a good alternative to other popular television services. To discuss your options for a new aerial, contact us today to appoint us as your aerial engineer in Bradford. The Aerial Guys have ready access to an extensive number of aerial engineers across the North of England who are capable of providing you with a prompt, affordable and efficient service. Our advice is impartial and is designed to offer you the best possible solution for your unique requirements. Transform the way that you watch television by calling us today to book your appointment. We provide a free, no obligation estimate and can usually attend your property on the same day. We enjoy going above and beyond for our customers so allow us to impress you with the quality of our services. Rhiannon works from home and often likes to switch on the TV in the daytime to take a quick break. “I know I shouldn’t do it, but I work odd hours. So, I like to watch catch-up TV when I’m taking a break at home from my office. It’s nice to have a bit of company in the day from the TV. But the last few months, my TV has really been playing up. Both the picture quality and the sound seem to have stopped working properly. It’s not been an easy time for me at all,” she says. In the end, Rhiannon decided to get some professional help and found The Aerial Guys on the internet. “I didn’t know a company like The Aerial Guys existed until I read about them. The fact that they are local to me was great. The engineer wasn’t patronising at all. He talked me through the repairs he was making and refused to start doing anything until I was happy with the quote – which was more than reasonable by the way! My TV is back to the way it was now and I’m really happy!” Rhiannon says.